We are always trying new organic products. This one caught our eye while walking through the store yesterday. Rachels Wickedly Delicious Organic Yogurt. The names looked cool and so did the product. Rachel's also has a laundry lis of health benefits. Rachel’s yogurt has probiotic bacteria for digestion, vegetarian Omega-3s for cardiovascular and other benefits, calcium for good bones and teeth and a prebiotic that has been shown to help increase calcium absorption. The milk is rBGH-free. They have 12 lowfat and creatively named flavors. This yogurt has been extremely popular in England for a long while now. 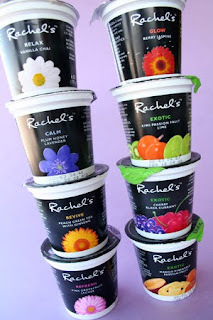 Now its made in Wisconsin (current U.S. law prohibits the import of fresh diary products), Rachel’s yogurt offers some great tastes as well as good nutrition. The 100% natural line is certified kosher for all our our jewish brothers out there. Head to the store buy some and you will love it!